Users can search on the database by: PDB ID, Pfam ID (Accession code), Pfam Pair, Sequences and Uniprots. The search functions can also be clicked by the navigation bar on the left page. Input a PDB ID to find the Pfam architecture of each protein sequence in the entry. 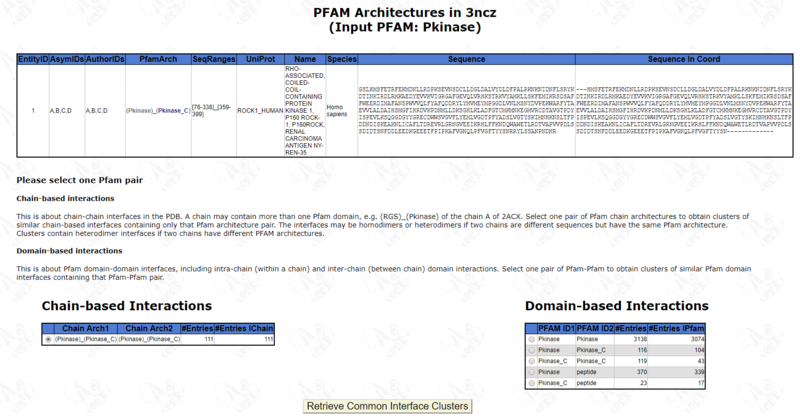 For instance, inputing PDB ID "3NCZ" will return a table with the Pfam architecture (Pkinase)_(Pkinase_C) for entities and two selection tables for chain and domain interfaces respectively. Selecting (Pkinase)_(Pkinase_C) Pfam architecture in the chain table will return the homodimeric interface clusters. The title of the table indicates the summary information about the (Pkinase)_(Pkinase_C) group. There are 52 crystal forms and 113 PDB entries in the group. The common interface of the first cluster occurs in 12 crystal form and 30 entries with minimum sequence identity = 45% and surface area = 2083. It is present 28 PDB assemblies and all PISA Biological assemblies. The second cluster contains 10 crystal forms and 30 entries with minimum sequence identity = 43% and surface area = 571. It is not present in any of PDB and PISA biological assemblies. Download interface files in PDB format for each cluster by click the cluster ID. 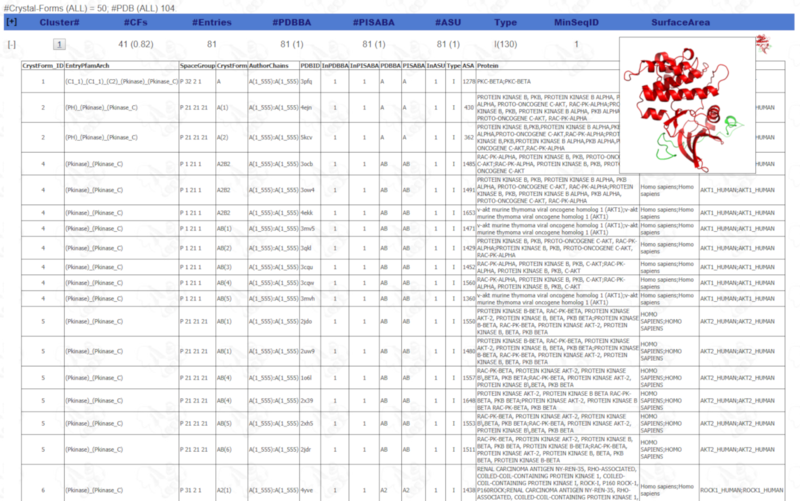 Download the text file of clusters by click "Download Clusters Data". 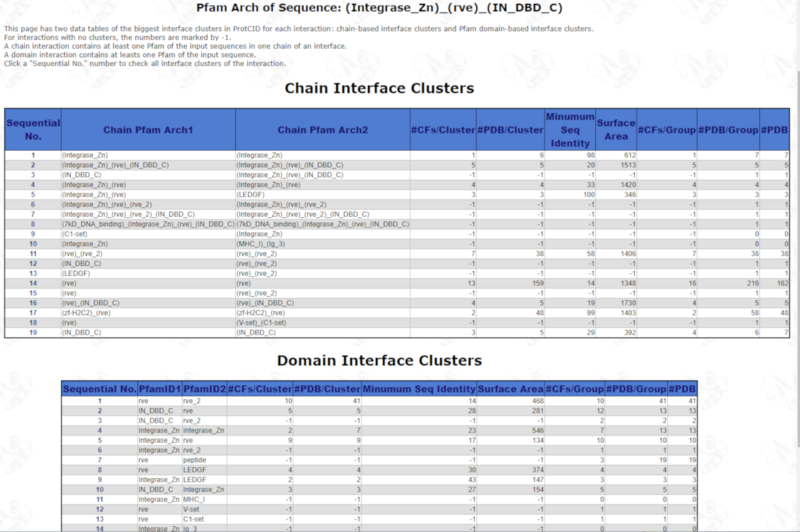 Download the sequence file of each cluster by click "Download Sequence Files"
Download all interface files in PDB format by click "Download All Cluster Interface Files"
Check those interfaces which are not in any clusters by click "Interface Files Not In Clusters"
Click the “+” sign to see the expanded table, which gives more details about the cluster: the crystal form information, PDB codes, whether the common interface is in the PDB and PISA biological assemblies for each entry, the PDB/PISA biological assemblies in ABC format, the surface area, protein name and species. Collapse the table by clicking the "[-]" in the first column. To download the interface files of each cluster, right click the cluster id. Pointing mouse on the image icon of a cluster will show a larger interface image. Selecting two Pfams in the domain selection table returns the domain interface clusters. After selected (Pkinase) and (Pkinase_C) Pfams, ProtCID returns the domain clusters. The Cluster 1 heterodimeric interface occurs in all 41 crystal forms and all 81 PDB entries with minimum sequence identity = 50% and the average surface area = 834. It is an intra-chain domain interface (The "Type" column is "I" which means "within a chain"). The domain clusters can also be expanded for interfaces in each cluster. Input one Pfam ID or Pfam accession code to find all PDB entries containing the Pfam. Since not all Pfams are in PDB, you can look through Pfams in the PDB using the Browse button at the top of each page. "Download domain-ligand coordinates, one from each PDB structure" is to download domain coordinates including interacting ligands and PyMol scripts to display domains which are aligned by their Pfam HMM positions. The domain with least disordered residues from each structure is selected. "Download domain-ligand coordinates, one from each UniProt sequence" is to download domain coordinates and PyMOL scripts. The domain with least disordered residues from each unique sequence is selected. "Download domain-ligand coordinates, one from each crystal form" is to download domain coordinates and PyMOL scripts. The domain with least disordered from each crystal form is selected. For more details about downloading domain coordinates and PyMOL scripts, please refer the help page of Pfam-ligand interactions. The picture shows the web page of Ras input. 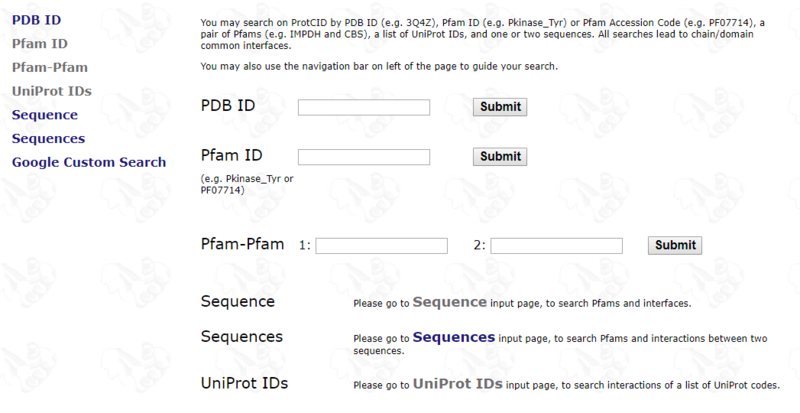 Input two Pfam IDs or Pfam accession codes to find all PDB entries containing the Pfams. Pfam pairs in PDB can also be browsed on Browse page. 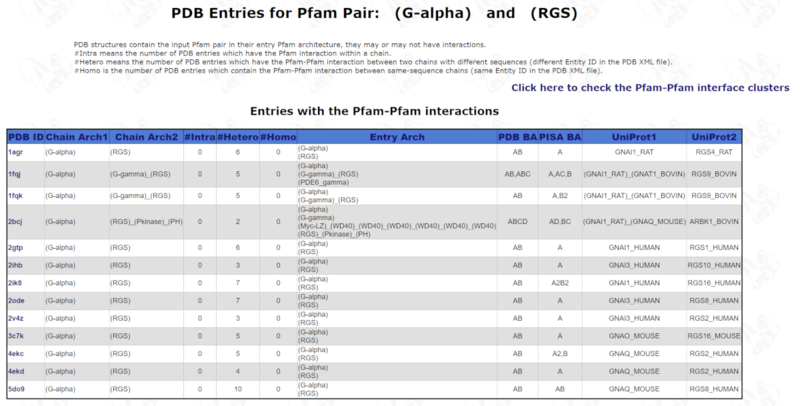 For an example, input Pfams G-alpha and RGS, ProtCID returns the PDB entries containing both G-alpha and RGS domains. "Click here to check the Pfam-Pfam interface clusters" will display the domain clusters. You can input one or two sequences. ProtCID assigns Pfams to the query sequence(s), returns the Pfam domains in a table. If two sequences are input, two tables are returned. 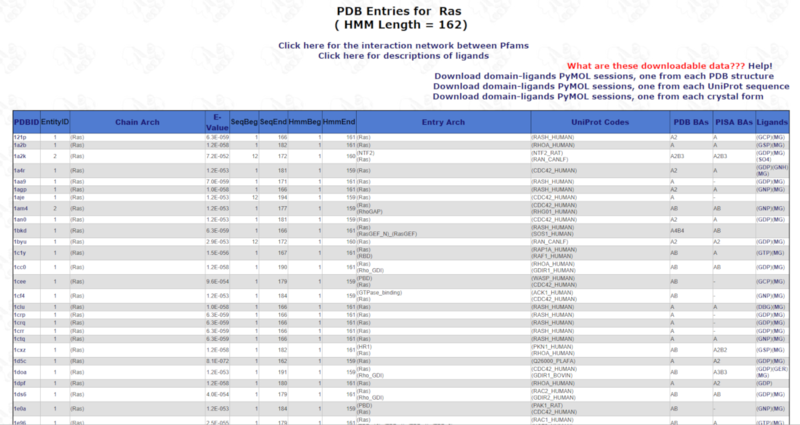 Click the button "View Pfam Arch in PDB" to display the table of all entry architectures that are in the PDB that contain one or more of the Pfam domains in the query. If two sequences are input, the table contains pair architectures that contain at least one Pfam domain of the first sequence and one Pfam domain of the second sequence. 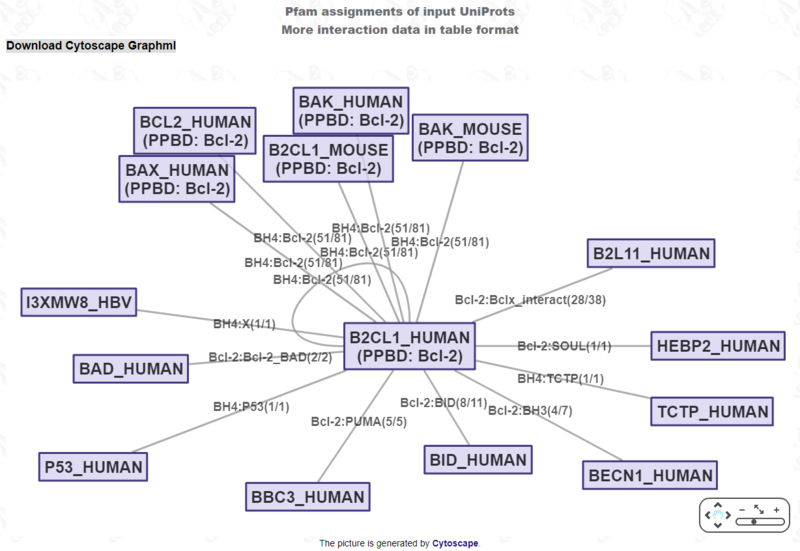 Input one Uniprot to find its interacting proteins. Input multiple UniProts to find either the interactions between them, or the interactions between the first Uniprot and all Uniprots in the list. Interactions occur either in homologous proteins of same Pfams ("Interfaces on Pfams") or are available in crystals ("Interfaces on structures"). Details please refer the help for Uniprots input . Input "B2CL1_HUMAN", a Cytoscape figure shows the interactions between B2CL1_HUMAN and any proteins including itself.